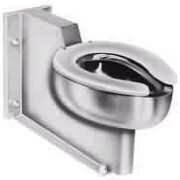 [XPB-WC7449FM] *DISCONTINUED* Front Mounted Siphon Jet Toilet is stainless steel and is fabricated with a bead blast finish. Toilet has a self- draining flushing rim. There are two different finishes to choose from: Bead Blast (standard) or Pollished Stainless Steel. Also, this toilet is ADA compliant. Specifications and additional details available by request. For shipping quotes, orders or questions please call our Customer Service Center at 1-877-483-9270.